Jeep's quality isn't the only thing getting better as time passes. 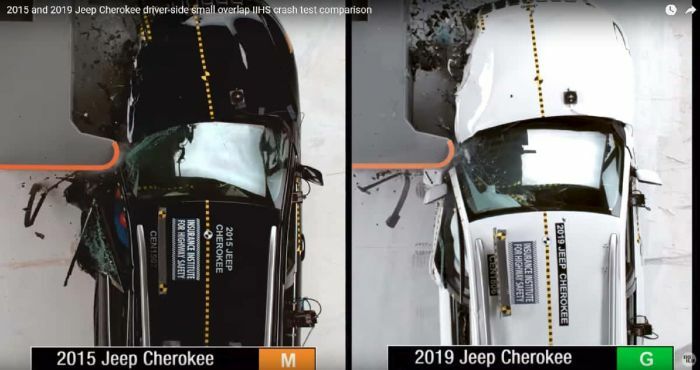 Check out how far Jeep has advanced the 2019 Cherokee's crash test result. The new 2019 Jeep Cherokee has many improvements of note. The new 2.0-liter turbocharged engine option provides strong torque at the low end of the rev band and does so with great fuel efficiency. Jeep also moved up significantly in the JD Power Initial Quality rankings in 2018, matching Toyota and earning a higher score than Acura, and Audi. To these and many more improvements, add a significantly better crash structure. The Insurance Institute For Highway Safety has just re-tested the 2019 Jeep Cherokee on the important small frontal overlap test. In 2017, the Cherokee scored just Marginal on the test. That score disqualifies any model from consideration as a Top Safety Pick. On the new test, the 2019 Cherokee has earned a score of Good. Cherokees built after April of 2018 now earn this score. Jeep made substantive changes to the Cherokee's structure to bolster protection of its occupants. Jeep changed the design of the A-pillar, front door hinge pillar, and door. In addition, Jeep also changed the driver's seat belt. All of these changes were as a result of having studied the results of prior crash tests. In past tests, the test dummy suffered knee, leg and arm injuries and its head barely even contacted the airbag. The results of the changes for 2019 are impressive. Jeep's Cherokee has now earned a score of Good on every crash test conducted. Our thanks to IIHS for the images and video.